Since I last wrote in mid-May, New Horizons has continued its traverse down the magnetotail of Jupiter. 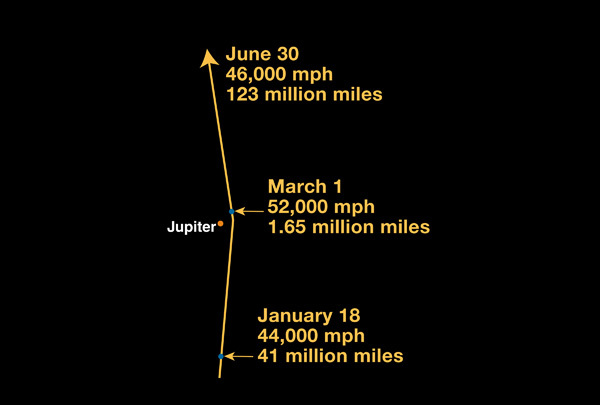 That final phase of our Jupiter flyby science will conclude tomorrow, on June 21. At that point, we will be 1.25 Astronomical Units, or about 120 million miles from Jupiter. (For Jupiter aficionados, that’s about 2,300 Jupiter radii from the planet). In the past month, our plasma instruments – SWAP and PEPSSI – revealed that the spacecraft had passed in and out of Jupiter’s flagging magnetotail a number of times as we exited this enormous, time-variable space plasma structure. While we’ve been collecting and shipping these data home, our science team has been busy with a series of its own tasks. One is producing a suite of scientific reports due to the journal Science on July 6 that summarizes important findings from our initial analysis of Jupiter system close-approach data. At the same time, our Pluto Encounter Planning team (yes, also known as the “PEP squad”) has been working to choose the best possible arrival date in July 2015. The PEP squad reached its conclusion (more on this below) in mid-May, and the full New Horizons science team ratified that conclusion on May 30. Since then, the PEP squad has been working its next task, to debate and settle on a closest-approach distance to Pluto and its three moons. That decision is expected to be presented to the full science team for consideration in late September. New Horizons Co-investigator John Spencer assembled this montage of Jupiter's Galilean satellites from images we obtained during Jupiter closest approach week. From left, in order of (but not to scale with) their distance from Jupiter, are Io, Europa, Ganymede and Callisto. The planet-sized satellites are to scale with one another. We have also submitted the various Jupiter data sets to the Planetary Data System for review and critique before final archiving. In addition, our instrument payload team has been planning the details of the remaining instrument calibrations we’ll do this September and October, as well as the payload check we’ll conduct during our first annual checkout after hibernating the spacecraft from late June until late August. Speaking of hibernation, we’re about to embark on our first operational hibernation phase of the mission! That will begin in less than a week, on June 27. We’ll hibernate this first time for just two weeks, before bringing the spacecraft out of its slumber for 10 days of activity (and the opening of our Alice ultraviolet spectrometer’s solar occultation port). Then we’ll go back into hibernation for about a month, until Aug. 20. During each of these phases, we’ll listen in on the spacecraft’s beacon tone transmissions (which indicate its status) twice a week. We’ll also downlink telemetry twice a week to trend how the active subsystems are doing. These contacts will be much more frequent than the weekly beacon tone transmits and monthly telemetry downloads we’ll do in mature hibernation beginning in March 2008, but since we’re gaining experience with hibernation, we want more frequent contacts and greater insight. This walk-before-you-run (“nap before you sleep”) philosophy is the most prudent way to enter hibernation. As I indicated earlier, from late August until early November, we’ll wake New Horizons for a full suite of instrument and spacecraft tests that we plan to do every year at that time. After we complete the 10 weeks of spacecraft and instrument checkout activities, we’ll re-enter hibernation on or about Nov. 6. During the wake-up period this fall, we also plan to conduct a small engine burn on Sept. 26 to trim up our trajectory to Pluto. We haven’t done a course-correction burn since March 2006, but we now need to change our speed by about 2.4 meters per second (about 5 miles per hour) to set the optimal course for a close Pluto flyby. 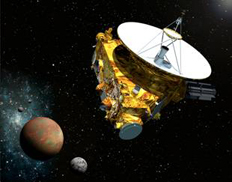 Without that course correction, we estimate that we’d miss Pluto by about 300,000 kilometers. That’s a little more than the distance between the moon and Earth, which would give us spectacular imagery, but not anything like what we want to achieve by coming 10 to 100 times closer. To prepare for hibernation, our mission operations team has been analyzing data from the five-day hibernation test we did in April, and testing spacecraft items like the backup navigation gyros and the fuel-cutoff valves that could be used if the spacecraft senses it’s in danger while operating autonomously in hibernation. This month the team also uplinked an update of our fault-protection and autonomy software to correct a few bugs and enhance some capabilities. And then what we came for: an artist’s conception of New Horizons near Pluto in July 2015. With these various preparations behind us, our mission ops team is ready to move into “real” use of the hibernation mode, which we’ll use 75% of the time from now until 2014 to reduce wear and tear on our electronics. Before I sign off, I want to conclude by telling you that after much analysis and debate, we elected to continue to our originally planned Pluto-arrival date of July 14, 2015. That date has been our plan since 2003, but we wanted to make absolutely sure it was the best thing to do. So, we studied the best maps of Pluto and its surface composition, analyzed the days on which the radio science and solar occultations would be best, looked at the viewing geometry and range of distances to the newly discovered moons Nix and Hydra, and considered more than 20 other factors. In the end, to our amazement, the best solution was still July 14! Keeping that date also means we don’t have to spend precious fuel to move our Pluto encounter day, so in addition to being the best date for exploring the Pluto system in July 2015, July 14 is also the best choice for future Kuiper Belt exploration that will come in the late 20-teens. It also will be the 50th anniversary of Mariner 4’s historic first reconnaissance of Mars back in 1965, a sweet coincidence. Well, that’s all I wanted to tell you about this time. I’ll be back with more news in late July. In the meantime, keep on exploring, just as we do.